A rendering of what the pier could look like. EAST HARLEM — Governor Andrew Cuomo has earmarked $1 million toward the rehabilitation of El Barrio's Pier 107 along the East River Waterfront in his 2016 budget. The funds will help with the $12 million replacement of the entire structure at East 107th Street, which only has about five to eight more years left before it becomes completely useless, according to Assemblyman Robert Rodriguez, who secured the funding. The pier has been closed to the public because of its poor condition, including a collapsed roof and unstable flooring, according to Civitas, a nonprofit that released an 8-month study in February 2015 on how to develop the East River Esplanade. 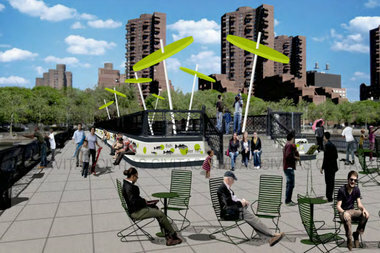 "The $1 million secured by assembly member Rodriguez for the 107th Street pier will go a long way toward the plan to re-energizing the waterfront experience for the East Harlem community and all New Yorkers who use the East River Esplanade," said Felipe Ventegeat, president of Civitas. Rodriguez proposed a 30-year feasibility plan in February 2015 called "A Tale of Two Rivers," which lays out a plan for multiphase reconstruction for Pier 107, starting with immediate and temporary repairs, and then later, its entire refurbishment over the next 10 years. In the same year, local elected officials — Rodriguez, Manhattan Borough President Gale Brewer, City Council Speaker Melissa Mark-Viverito and Senator Jose Serrano — set aside $1.1 million to remove the broken roof, repair the pier's surface and add new street furniture. The city's Parks Department has not announced a timeline for that work to begin, although it should begin shortly, and the full $12 million rebuild and redesign of the pier won't happen until more funding is secured, officials say. "This crucial new $1 million investment for the revitalization of Pier 107 will strengthen the vital infrastructure around the pier and give the residents of El Barrio a beautiful space that will create economic growth for the surrounding neighborhood," Serrano said in a statement.